Excel and many other programs use icons to visualize the file extension. 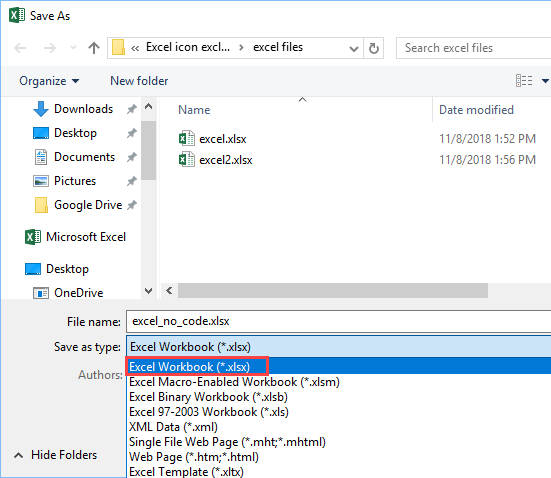 If you see an icon with an exclamation mark on it, you may wonder whether the file contains an error or it’s corrupted, but you don’t have to worry, it just means that this is a macro-enabled Excel file. If you want to write some VBA code, you should use these format. This type of format was introduced in Office 2007 and is continued since then. Here, you have three types of files inside the Windows File Explorer. Each of them has a different icon. But you don’t know what extension do they have. You can change that (in Windows File Explorer) by going to View >> Show/hide and check the File Name Extensions option. This will display both the file name and its extension. Now, you can see that the first file is the pre-Excel 2007 version of Excel. The third format is was created after the Excel 2007 version, and the file between them is a macro-enabled file. If you create some VBA code and try to save it as xlsx file, you are going to get the following error. If you want to get rid of the exclamation mark, you can just save the files as normal xlsx files. Be aware that it will get rid of all macros inside this file, so any function written in VBA will be gone. But if you don’t have any important code or any code at all, you can go to File >> Save As >> Browse and choose the following settings.